There was a time in my life where I hoarded clothes. When I first moved away to college, I hadn't gotten rid of anything from high school. I didn't even take the time to go through my wardrobe to see what I was holding onto, despite not wearing half of what was in my closet. I slowly started to pick up clothing that reflected my ever changing styles. I went from being somewhat preppy at the end of high school and beginning of college (think all J. Crew everything) to being overly girly (think lots of dresses and skirts in various florals), to whatever I am now. Through all of that, I never really got rid of any of the pieces that I didn't wear. They merely sat in my closet while I filled it with new items. 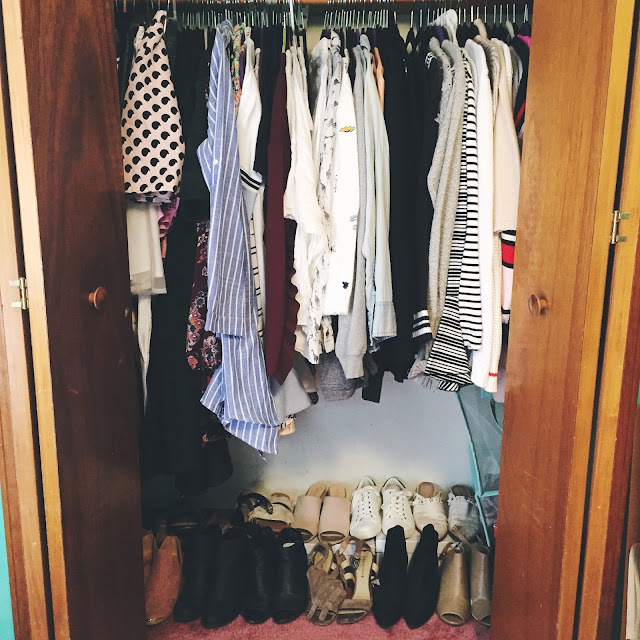 Over the course of the past year, I finally learned how to manage my wardrobe and get rid of things that just weren't getting love. I used to live by the rule that if I haven't worn it in a year, it needed to go. I've gotten even tougher with it now, telling myself that if I haven't worn it that season, it needed to go somewhere. I don't think there's any excuse to not wear something during a season, especially if you live in a more mild climate where some of the seasons seem longer than the typical three month period. There are plenty of things you can do with your old clothes, especially if some of them are new or gently worn. If you have higher end clothes, I'd highly recommend consigning them if they're gently worn. You can look up luxury or high end consignment stores in your area or use online services like The Real Real. True consignment stores are typically 50/50 splits on your items and you get paid when they sell, but the online resellers might have different splits. If you take your items to a secondhand store (Clothes Mentor, for example), you'll only get about 30% of what your items will sell for, but you receive cash on the spot. You'll make more money for a bit of patience, but if you don't generally care and you just want to get rid of items, then selling for cash outright might be the best option for you. I have this under a separate section that consignment because while you're using a secondhand seller, you're responsible for setting a price, taking the photos, and managing potential buyers and shipping. I've sold a few of my pieces on Poshmark, but sometimes it's a pain waiting for buyers. I'm one of those impatient types where I would just rather have them sell and get them out of my life instead of holding onto them. If you have a few higher ticket items that don't take up a lot of space, maybe test those ones out online, but if it's just a J. Crew t-shirt or something, you're better of just selling through one of the consignment/second hand stores. Another option is to turn your clothes into something else, if you're crafty. I personally am not, but my aunt who I give a lot of my hand-me-downs to can transform a romper into a pair of shorts and then take the top and use it as part of a dress. If you're a little more creative and fashion design savvy, there are tons of Pinterest DIY ideas that my aunt uses in addition to her all around creative mind. I don't have younger sisters to give my clothes too and I'm a bigger size than my younger cousins so all of my hand me down clothes go to my aunts. It's really cute, actually. I love seeing people get use out of the clothes that I never could or just didn't fit my style anymore. I gave some pieces to my roommates and friends over the past couple of years. If I see something that I don't wear that I know will suit someone's style, I don't see any reason in keeping it or taking the time to sell it! There's always, always, always the option to donate clothing. You can donate to the Salvation Army, Goodwill, local donation centers, wherever you find suits what you have. Obviously, if something is dirty or has rips of holes, instead of throwing them out, you can also donate to Planet Aid if your area has a location. Clothes are either donated or recycled, both of which are good for the environment and humanity. Anything that I have left after selling and giving away to friends and family always ends up in a donation bin and has for many, many years. This was such a great post! It's always better to give your clothes to someone who will actually enjoy them instead of keeping them in your closet! I'd much rather give them away than see them thrown in the trash or anything of that sort. Gotta recycle one way or another, right?! I wish we had the same shoe size... I'm coveting some of those in your closet! LOL, I still haven't been able to part with any of my shoes yet!